Practically everyone carries a cell phone today. It’s important to be mobile and accessible at the same time. The only problem is that many cell phones practically become paperweights when they don’t have a strong signal. What good is a phone that can’t make a phone call? Cell signals quickly degrade when you go indoors – walls, metal objects and a variety of other factors interfere with cellular signals which can render a mobile phone worthless when you’re indoors. There are several products on the market that purport to boost or pump up the signal on your phone, but the Wi-Ex zBoost Cell Phone Signal Extender is one of the first consumer-based products that actually does what it claims to do. The key word in the product title is “extender.” The zBoost does not magically create a cell phone signal where one does not exist. It simple extends, or “boosts,” the level of a faint signal that already exists. In other words, if your phone only gets a single bar inside your office or home, the zBoost could potentially give you a full 4 bars. I tested the zBoost in my basement where my cell phone never got above 1 bar on the signal meter. The zBoost Cell Phone Signal Extender is unbelievably easy to set up, and I had 4 bars within a few seconds of plugging everything in. The zBoost Cell Phone Signal Extender consists of a 6″ x 4.5″ base unit, a foot-long cylinder antenna, and a 35-foot coaxial cable that connects the antenna to the base unit. In order for the Extender to work properly, the main antenna needs to be at least 15 feet away from the base unit. Preferably, you’ll place the antenna close to a window where the signal is as strong as possible (you might want to walk around with your phone to find the strongest signal in the room). Wi-Ex graciously includes mounting hardware and instructions if you need to install the antenna in an attic or on the outside of your house/office. Next you’ll need to thread the coaxial cable (the same type of cable used for television) from the antenna to the base unit. The base unit should be up off the floor and there is a smaller antenna that gets plugged into the base unit. The base unit is what “extends” the signal around the room in which it’s placed, so ideally it should sit as close to the middle of the room as possible. Lastly, you simply power up the base unit with included power supply. The three lights on the base unit blink around while it scans for a signal, and within a few seconds, your phone finds a full, strong signal, ready for a crystal clear phone call. If you like to use your phone in your office or home, but the signal is rarely strong enough, the zBoost Cell Phone Signal Extender could provide a painless and easy solution for boosting the signal indoors. 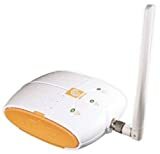 A strong signal is not cheap – the zBoost Extender sells on ThinkGeek.com for between $249 and $359, depending on what model you purchase. The model you select is extremely important – if your phone is tied to AT&T, Verizon or Alltel, you’ll need to get the 800MHz model. If you’re a T-Mobile or Sprint customer, you need the 1990MHz model. 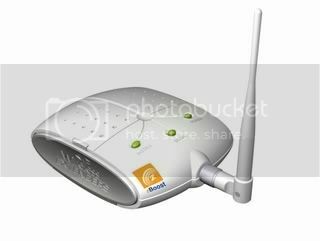 Or if you’re willing to pay the high end of the price, you can elect for the dual-band model which will run everything except Nextel (Unfortunately, Nextel is not supported by any model). Visit the zBoost Cell Phone Signal Extender page on ThinkGeek.com for more information and pictures. If you own a cell phone, a digital camera, an MP3 player (not an iPod), a PDA, then you’re probably juggling several memory cards among the group of them. By far the most popular memory card format that all of these gadgets use is SD, which stands for Secure Digital Card. Today, however, as gadgets get smaller, the memory cards have shrunk as well. So in addition to the SD card, we now have its younger brother appropriately called the miniSD card. And even more incredible is the baby of the bunch known as the microSD card that’s actually smaller than a fingernail. The standard SD memory card has become a popular standard because it’s about the size of a postage stamp. The size is easy to handle, and easy to slide in and out of a tiny slot in the side of a digital camera or cell phone. SD cards only held a few megabytes worth of data just a few years ago, but now boast capacities over 8 gigabytes (GB). Many laptop computers now feature an SD slot so that you can easily transfer pictures from your digital camera or cell phone. If you don’t have an SD slot, there are a variety of USB card readers you can purchase (such as the SanDisk ImageMate 12-in-1 Reader/Writer I reviewed last year). When the miniSD and microSD cards started appearing over the last few years, people not only got confused with all the SD-compatible formats, they had to find appropriate methods for transferring the data among their devices. That’s why the fine folks over at Kingston Technologies came up with the Mobility Kit. The heart of the Mobility Kit is the teeny-tiny microSD card. This thing is actually hard to pick up because it’s so small – it only measures 11mm x 15mm x 1mm. If you have a cell phone, digital camera, or digital media player that uses the microSD memory card format, you can transfer files (pictures, music, videos, etc.) to the microSD card via the included USB card reader, which again, has to be the smallest USB card reader I’ve ever used. The microSD card slides into the back of the tiny USB reader, which then plugs into your computer. 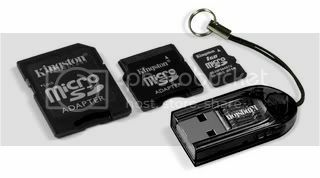 If you have a device that uses a miniSD memory card, the Mobility Kit provides a miniSD adapter. This adapter is the exact size of a miniSD memory card, but it has a tiny slot at the bottom where the microSD card can slide inside. And if you need a full-size, standard, SD card, the Mobility Kit also includes a standard SD adapter for the microSD card. So basically, the Mobility Kit can handle any SD-compliant memory device that you can throw at it. The Mobility Kit comes with either a 1GB or 2GB microSD memory card, and the prices are incredible. I found the 1GB model for $25 and the 2GB model for $34. At those prices, it might be a good idea to just get one in case you ever find yourself juggling more memory cards than you can handle.